Is there a way to get a replacement for just the arm cuff that goes along with this SPA brace? There is not a replacement for just the bicep cuff. Where on the shoulder pads do the buckles attach? I'm a lacrosse player and need my ROM of abduction and ext. rotation limited so this product seems perfect. My question is, what type of hook/attachment piece does this us it use to attach to a shoulder pad? (Velcro, motel hooks, etc..) We wear similar shoulder pads in Lacrosse to football, but they are lighter in weight and mostly use compressed foams instead of hard plastic. The SPA is attached by drilling a hole in the shoulder pad and scewing the strap onto it. I do not believe it will work with Lacrosse pads. You may want to look at the Don Joy Shoulder Stabilizer or the Sully Shoulder Stabilizer. I play offensive line. I am about 6 3 275. My shoulder subluxes often because i have a torn labrum and am attempting to finish the season. What size should i get? I also already have the donjoy sully shoulder support brace. Is purchasing the spa a good combiniation for the support brace? My son plays competitive ice hockey as a forward at a high level. He is a physical player who has endured shoulder surgery on each shoulder due to a torn labrum. Do you make a brace for both shoulders and if so, which brace would you recommend for his sport and situation? 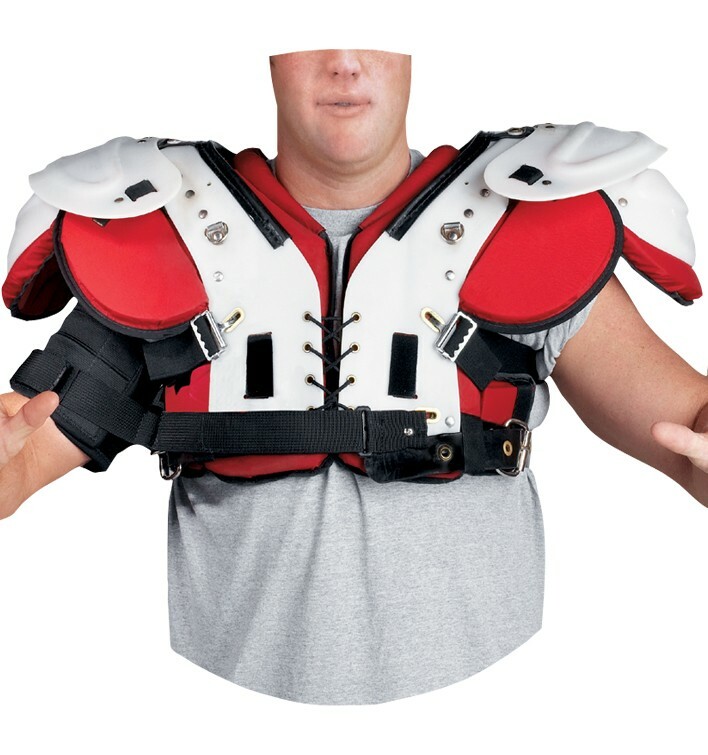 Furthermore, can the recommended brace be customized to fit in a pair of hockey shoulder pads and who would you suggest we reach out to get this done asap in Colorado? the dr. recommended this for my son last year. it worked well. the anchor point that attached to the pads somehow didn't stay with the rest of it. probably still bolted to a set of shoulder pads in storage or lost in the coach's stuff. can I buy the anchor point separately? the two inch strap with metal ring and mounting bolts. I need this brace for both shoulders. Do I buy 2 or will one do both? I wanted to know which one you considered better for a defensive lineman. The sully or the shoulder stabilizer spa and why? It depends on what motion or motions you want to resrict. The Sully gives you the ability to restrict the shoulder in more motions and instabilities. The SPA will only restrics shoulder abduction and external rotation. I play cornerback and have to rely on my hands to swat passes and jam receivers, what is the farthest i could loosen this brace without risking my shoulder to re-dislocation (I have a torn labrum and hills-sachs lesion)? Thank you for your question. DonJoy Shoulder Stabilizer Shoulder Pad Attachment (SPA) would be a good brace if your son is a line man. If he needs more range of motion the DonJoy Sully Shoulder Stabilizer would be a better option. If you have any further questions, please feel free to call us. After 39, yes 39 dislocations and 5 operations i need every support i can get when sporting! This product looks great for possible contact avoidance. Is this product ready to use or do you need the DonJoy Shoulder Stabilizer and then add these on top of that? Coulkd you help me out. This is an attachment to shoulder pads for a football player. If you want a shoulder Stabilizer you could either get the DonJoy Shoulder Stabilizer https://www.betterbraces.com/donjoy-shoulder-stabilizer or the Sully Shoulder Stabilizer https://www.betterbraces.com/saunders-sully-shoulder-support Either of these will help to restrict motion in the shoulder during activities. Can you buy a arm cuff without buying the entire brace? Unfortunately there are no replacement parts for this brace. Will this help with a grade 1 ac joint separation? The SPA is a shoulder dislocation brace. If you have a AC Separation I recommend the AC Shoulder Brace. The Spa Attachment is for Shoulder Dislocations. If your injury is Biceps Tendonitis or Biceps strain, I recommend a Sleeve for compression until the injury heals. My son has slight torn labrum and the shoulder comes out of socket at least once during football? He plays wide receiver and cornerback. So he needs enough mobility to catch and enough to keep the shoulder stablized. Which product would be best for football and which product would be used while playing basketball? The surgery was suggested but we decided against it because they told us no quarantees. Therapy does help. Shoulder Stabilizer-limits shoulder flexion and external rotation. Very durable, high strength, best for football athletes. Capable of limiting motion, keeping athletes out of the danger zone for dislocation which is anything above 90degrees of flexion/and 90 abduction. Sully-great for basketball, baseball. More flexible stabilizer made of neoprene. Great for shoulder multi-directional instability without injury. Straps made of neoprene capable of limiting motion. SPA- biceps strap only. Is drilled into shoulder pads by Athletic Trainer or Equipment Manager. This does not include chest brace. It's just the biceps strap that will limit shoulder flexion. All these braces are designed to keep the athlete from raising their hand up in the air, because this is the position where dislocations happen. I recommend speaking with the schools Athletic Trainer and get their recommendation regarding trying to play with such an injury. I recommend the Sully, due to his position. He needs to be able to reach above his head, but know that this will not prevent his shoulder from Dislocating. Can you show diagram for proper installation. How many parts and straps come with this? Molly, i will send you the directions for this brace. My son had right shoulder surgery last year and now has hurt his left shoulder. He pops out the back so I would like to know if this would keep him from having shoulder surgery right away. He really wants to play this season. This product is designed to restrict range of motion. My son plays defensive end and will possibly try out for slot. He has hyperextended his shoulder during a tackle last season. He may have damaged some of the cartlidge but our surgeon is trying to avoid surgery. Will this brace be the best one for him to use? This brace attaches to the shoulder pads, it will restrict his range of motion and keep his shoulder in a comfortable range. If he plays other sports you may want to look at our Sully Shoulder brace. It will do the same thing but can be worn without shoulder pads so it can be used if he participates in sports besides football. Hi my son suffered a broken collar bone two years ago. Since then his shoulder dislocates or "pop out" when extending his arm up or tackling in football. Which brace would be best? He is a running back, but also plays offensive lineman, he is concerned about moblitiy, but also needs his shoulder stabilized. His right arm suffers most frequently, however his left does this occasionally too, do you recommend a bilateral, and does this offer the same support, and mobility if worn on both shoulders? You should look at the bi lateral sully. It will provide support and some range of motion restruction. It can be worn underneath the shoulder pads and can be worn for other sports as well as football. How would this work for a nose tackle with a torn labrum? It would work well. You can set the arm in a position that he can still tackle and not hurt his shoulder. I am a RB in football and my shoulder is kind of messed up. My labrum is torn and there is a part of my joint socket missing. It popped out several times and I will probably have surgery in fall. The football season in Austria is in spring though. My shoulder hasn't popped out since October 2nd and it's feeling pretty healthy. So my question is which one of the shoulder supports would be the best for my situation? So which one would be the smarter choice? I don't really care about movement restriction, because I usually just have to keep my arms on the ball. Are you only playing football or are you playing other sports? If you are always playing football with shoulder pads, I would recommend the SPA. Shoulder Pad Attachment. This will allow you to set the strap in a position so that you can still catch a ball and run plays yet protect your joint from popping out. Should you have any questions call us at 800-553-6019. My son plus a strong safety in football, should I feel confident enough that his shoulder will stay in place? For I am scared of a recurrent dislocation! I would suggest him going with the DonJoy Sully. It's going to help control his shoulder, while still giving him some range of motion to be functional in the activities he needs to do. My son has a left shoulder injury. Your instructions are too difficult to understand and it looks as though it is for a right shoulder injury. I don't understand how you put this thing on and correctly wrap it. Can someone guild me through this? 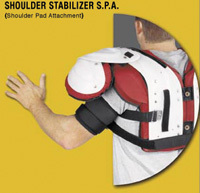 With the Shoulder Stabilizer SPA brace...how is it attached to football pads? Would specific shoulder pads be needed to use this? It is attached to the breast plate of football pads. There would need to be a rigid breast plate design for the shoulder pads used with the SPA. With regard to limiting mobility how does this compare to the Sully Brace? My son has a bilateral Sully Brace (both shoulders) but it is VERY hot so we are looking at this as an option. Also, can you get this as a bilateral brace or is it a matter of overlapping 2 separate braces? If you have to use 2 separate braces is that comfortable or do you think he's better off sticking with the Sully Brace? The Donjoy Shoulder Stabilizer offers superior shoulder stability over the SPA and the Sully. The Shoulder Stabilizer can be ordered as a special for bilateral shoulder bracing however; it won't be much more breatable than the Sully. You can attach the SPA bilaterally which will be more breatheable but offer less stability. Please let us know if you have any other questions. A Bankhart Lesion is a tear of the shoulder capsule. It is up to your physician, physical therapist, or athletic trainer to determine your limited range of motion during your recovery and rehabilitation. There will be some limitation in motion as when wearing any brace. However the DonJoy Shoulder Stabilizer Shoulder Pad Attachment (SPA) is excellent at preventing further dislocation, and will help raise awareness of the potential to dislocate. My son dislocated his shoulder last year. The dislocation went down while making a tackle in football. He is a receiver and is concerned that any brace will limit his ability to reach above his head or to the side to catch the ball. Do you make a brace that would be affective but also allow for freedom of movement for this position? Unfortunately any shoulder brace will limit the range of motion slightly, however the brace will also serve to remind the player of an existing injury as well as providing support The DonJoy Shoulder Stabilizer and the DonJoy Shoulder Stabilizer Shoulder Pad Attachment are both designed to be worn during contact sports, such as football. my son has loose shoulders that tend to pop out to the back. Will this brace help secure his shoulder and help it to keep it from popping out. The DonJoy Shoulder Stabilizer Shoulder Pad Attachment (SPA) will definitely help prevent the shoulders from "popping out". Arm strap ripped apart after3 weeks of use. Need to have it redone.